NACOGDOCHES, Texas - Christopher Talbot, director of the School of Art at Stephen F. Austin State University, announced the recipients of SFA and Friends of the Visual Arts scholarships for the 2018-19 academic year at the recent opening of the 35th Annual Art Alliance Spring Show. More than $35,000 in scholarships was awarded. Weelynd McMullin, Nacogdoches junior, awarded a Patricia Roberdeau Mast Scholarship. Sarah Gray, Royce City junior, awarded a Patricia Roberdeau Mast Scholarship. Chrissa Hibbitts, incoming freshman from Keller, awarded a Regents Scholarship for Housing. Reilly Jerding, incoming freshman from Cypress, awarded a Regents Scholarship for Housing. Erik Ordaz, Mexico City, Mexico, graduate student, awarded the Piero Fenci Scholarship for Ceramic Arts. Sarah Jentsch, Etoile junior, awarded the Charles D. Jones Art Scholarship and the Barbara Brown Schoenewolf Art Scholarship. Samuel Langston, Hudson sophomore, awarded the William E. Arscott Art Scholarship. Aldo Ornelas, Chihuahua, Mexico graduate student, awarded the Gary Q. Frields Art Scholarship. Chloe Garrett, Orange freshman, awarded the Robert Kinsell Art Scholarship. Shelby Locklin, Southlake sophomore, awarded the Gary Parker Art Scholarship. Jacob Moffett, Hockley senior, awarded the Art Alliance Scholarship. Mason Cullen, Cypress freshman, awarded the Brian Philip Joseph LaBarbera Memorial Art Scholarship and the Debbie Simpson/Terry Miller Memorial Art Scholarship. Ethan Thomas, Sugarland freshman, awarded the Elsie and JoAnn Arscott Memorial Art Scholarship. Austin Cullen, Cypress junior, awarded the Melba Cranford Memorial Art Scholarship and the Stephen F. Weeks Memorial Art Scholarship. Emily Buckland, Grapevine senior, awarded the Jack R. and Claudine W. McKinney Memorial Art Scholarship. Tracy King, Killeen senior, awarded the John and Doris Daniel Art Scholarship. Rebecca Schneller, Abilene graduate student, awarded the Snyder Family Art Scholarship. Bailey Crow, Pinehurst freshman, awarded the Diane, Court and Casey Fouts Art Scholarship. Clay Cyr, incoming freshman from Houston, awarded the Friends of the Visual Arts Incoming Student Scholarship. 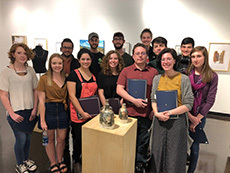 Among the 2018-2019 SFA art scholarship recipients are, back row, from left Aldo Ornelas, Tracy King, Jacob Moffett, Emily Buckland, Austin Cullen, Ethan Thomas; front row, from left, Sara Gray, Bailey Crow, Madeline Castillo, Chloe Garrett, Weelynd McMullin, Sarah Jentsch and Beckie Schneller.